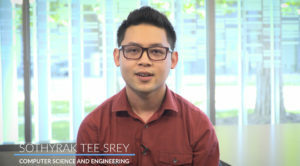 Sothyrak (Tee) Srey’s voice fills with excitement when he recalls the day he learned he had been awarded the Alan Turing Memorial Scholarship. 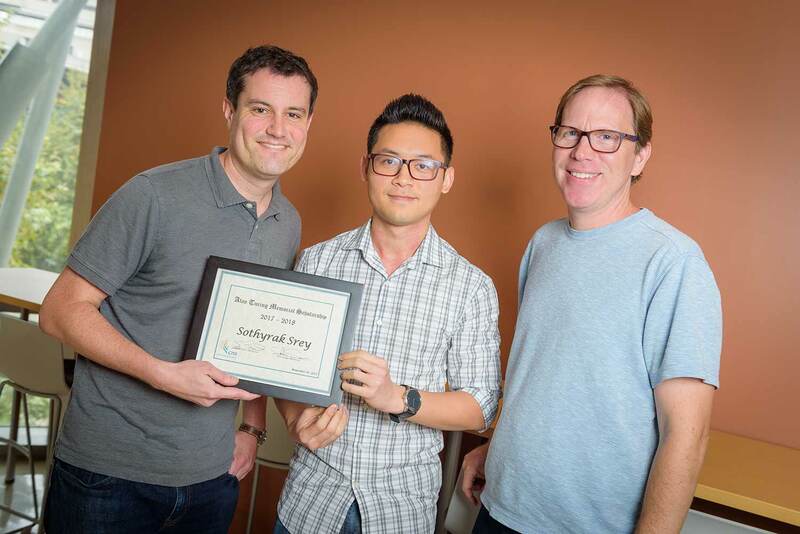 Originally from Cambodia, Srey enrolled at San Diego Mesa College before transferring to UC San Diego to study computer science. He describes his first year at the La Jolla campus as equally difficult and amazing. He lost confidence when he no longer maintained the 4.0 GPA that he held in community college, but was elated to land his first internship. Balancing work and classes was stressful, but he met new friends and colleagues who motivated him. Best of all, Srey found a community where he was able to just be himself. 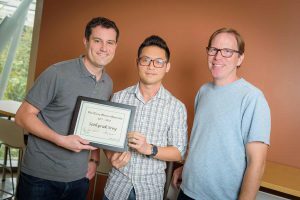 The Center for Networked Systems (CNS) at UC San Diego established the Alan Turing Memorial Scholarship in 2015 to encourage a more diverse community in computer science education and research. The award honors the memory of Alan Turing, the mathematician and cryptanalyst who founded the field of computer science. During World War II, he devised the techniques that led to breaking codes produced by Germany’s Enigma machine—a breakthrough credited with accelerating the Allied victory by more than a year. After the war, he was persecuted for being gay. He died by his own hand in 1954. Srey is the second student to receive the scholarship. Last year, Valeria Gonzalez became the inaugural recipient. A third year transfer student majoring in computer engineering, Gonzalez says the award provided much more than financial support. Professors George Porter (left) and Stefan Savage (right) with Sothyrak Srey. Srey echoes this sentiment, and adds that the scholarship has given him greater confidence to pursue his goals. 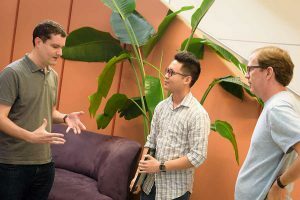 Ultimately, he wants to return to Cambodia and start a nonprofit that teaches underprivileged children to code. He also hopes to empower the LGBT community in Cambodia, building a safe space for LGBT youths. The Alan Turing Memorial Scholarship is open to undergraduates majoring in computer science or computer engineering who are active supporters of the LGBT community. The scholarship is awarded to students based on academic merit, with preference for students with demonstrated financial need. The Center for Networked Systems, an interdisciplinary computer science research center at UC San Diego, established the scholarship with gifts from the center’s annual giving fund. The center is now looking for additional philanthropic support to create an endowment, which would enable the scholarship to be awarded in perpetuity. For more information about supporting the Alan Turing Memorial Scholarship, call 858-534-8305 or email jduca@ucsd.edu; donations can also be made online. All gifts contribute to the Campaign for UC San Diego.